From surf to sun, culture to outdoors, Sydney is the perfect location to enjoy all of the best things in life. Its beautiful coastline extends for miles, scattered with islands, national parks and scenic treasures. We’ve collected the five best natural swimming holes near Sydney for you to climb, swim and splash your day away in. A trek to Gledhill Falls is not for the faint hearted. For those who have the courage to seek out the elusive beauty and secret coolness of the accompanying 10-metre wide watering hole, these forest-encircled falls are well worth the trek. Drive your car from Mona Vale Road onto McCarrs Creek. After about 4.5 kilometres you should reach a tiny bridge that crosses McCarrs Creek. You’re on the right track – just prepare for some rock scrambling! 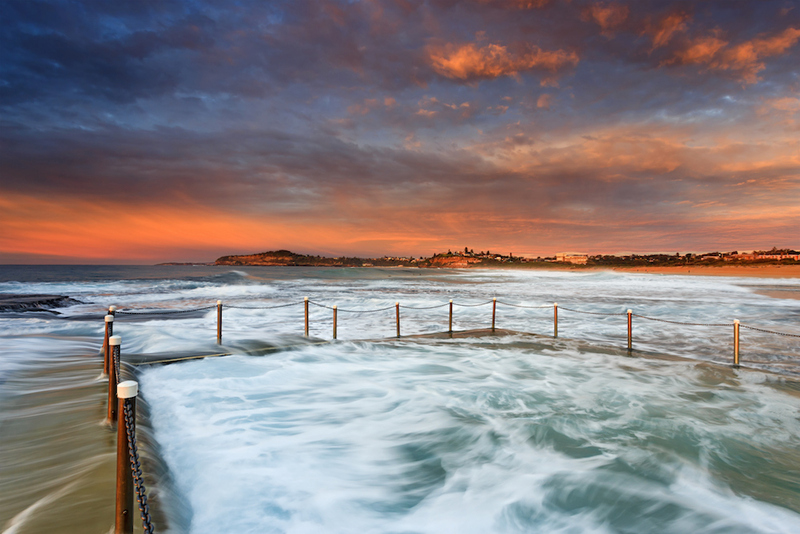 One of Sydney’s little unique secrets, Ivor Rowe Rock Pool is a small oasis located in the seaside rocks of South Coogee – just an easy two-kilometer walk south of Coogee Beach. A photographer’s paradise, the rocks around the pool offer a unique mix of colours, ocean views and a real diversity of aquatic life. Wade through one of the smaller pools along the Coastal Walkway which are perfect for a quick dip. Laze in the cool water and observe the natural sea inhabitants amongst the rocks. Bargo River Gorge is full of large, sandstone swimming holes, but Mermaid Pools‘ gentle cascade and deep waters mark it as one of the most beautiful natural swimming holes near Sydney. There are two ways to enter the deep pool: one is to jump right in from the 10 meter jumping point; the second is to jump right in from the 20 meters jumping point. It may be intimidating, but once you’ve taken the plunge into Mermaid Pools there’s a rope with which to pull yourself out before getting ready to jump in again! To reach Mermaid Pools, drive to the car park just off Charles Point Road and take a 45-minute walk through native bush. If you want to continue exploring, there are trails past the pool leading to Sugar Loaf Pass, Pencil Falls and Tahmoor Gorge. Jump into the salty, green water of Royal National Parks 60m deep pool and emerge a new person! The pool springs from Port Hacking’s thin finger of deep water that twists and turns its way through the National Park. Fresh water cascades over the sandstone edge of the pool to mix with the saltwater, creating a spectacular affect. The entrance is located just off the Winifred Falls Fire Trail and is a moderate 1.7km through natural trails. Enjoy this pool by the light of the sun or by the not-so-natural but oh-so-romantically placed floodlights for a nocturnal dip. A quick climb down the staircase that cuts down from Marine Parade car park, Mahon pool is wedged in the rocky outcrop of Marabra’s cliff tops, overlooking the vast Pacific Ocean. If you’re looking for a calm dip, pay close attention to the day when the wind’s blowing and the water’s high – Mahon Pool is renowned for it’s fun rolling waves making it one of the most popular natural swimming holes near Sydney!